Ohio State and Virginia Tech meet for the first time on Saturday night. Having lived in Virginia for many years, the stakes are high (at least for me, personally). 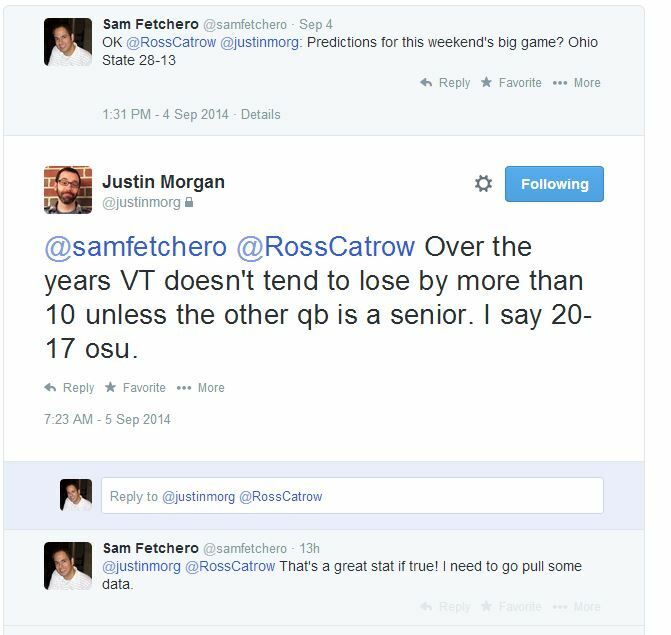 My buddy JMorg, a true Hokie fan, posited an interesting opinion via twitter: “Over the years VT doesn’t tend to lose by more than 10 unless the other qb is a senior.” I wondered, is this true? I pulled data from the past 10 years to see how many games Virginia Tech lost by more than 10, and who was the opposing QB. I was surprised by 2 insights. Insight #1: JMorg’s observation appears to be false. 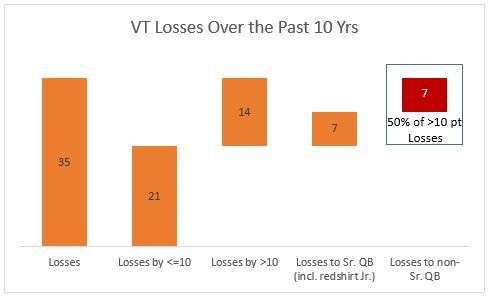 40% of VTs losses over the past 10 years have been by >10 points. Of those, 50% were against quarterbacks who were true-juniors-or-younger. Key Takeaway for me: I had picked Ohio State to win 28-13. While I do think VT is beatable by >10 points by non-SR. QBs, I wouldn’t put Ohio State J.T. Barrett in the category of the QBs listed above. I’m going to revise down my projection to a 10-point win, Ohio State 23-13. Great observations, JMorg!